Crikey! I really can't explain how I've missed this up until now. Splendid. Yara - here by popular demand. That was all over a little too quickly so I'll move on to the name with the next highest number of votes. 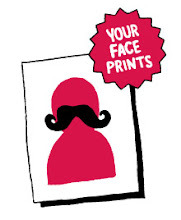 If you're called Katie/Kate expect to see your portrait appearing here over the next few weeks. The votes have been counted and it would seem Yara is the most popular name around here. A most extraordinary result as I only have one face in my inbox that goes by this most wonderful of names. 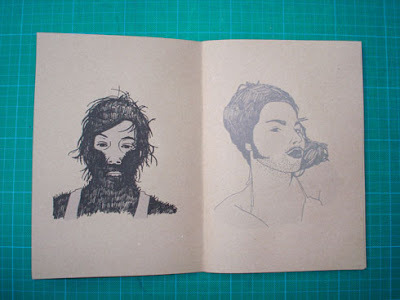 I guess it makes things a whole lot easier for me with just a single portrait to draw. Last face before I count the votes. While we wait for the last few votes to trickle in. Now that the last Brooke has been uploaded I'm going to open up the next name for debate. leave a comment on this post to vote for the next name I pick out from my inbox. In the event of a draw (or more likely - no votes at all) I'll carry on randomly choosing. 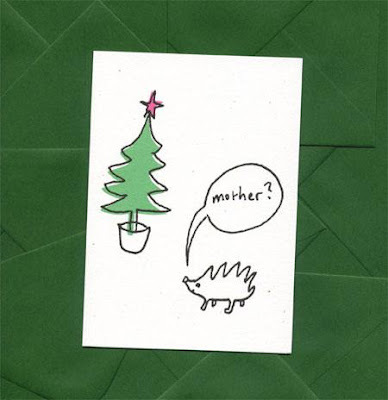 Christmas cards are now available online from Soma Gallery in Bristol and The Red Door Gallery in Edinburgh. I'm going to try to make time to kick-start this blog next week but in an effort to meet this month's targets and relieve myself of what was looking like a less than positive performance review for September, I offer you this. Nothing I can say is going to convey the dangerously high quantities of joy that you will experience listening to Giggle Party. I'll leave it to you to decide which of these two shady individuals is Sarah. 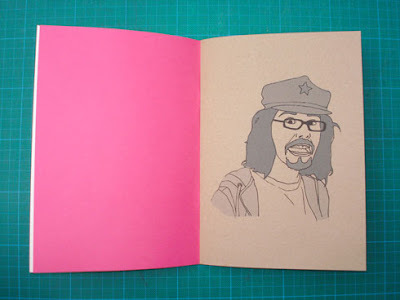 With a cameo from Steve (Face 233) who you will obviously remember as creator of Theme from Your Face..
Curated by Sarah Kate Wilson. Rapunzel Rapunzel, presents works by eight of the most exciting emerging female artists currently living, working and exhibiting within London. By employing painting, printmaking, sculpture, textiles, collage and drawing these women artists, reference themes of fairytales, dreams, mythological visions, memories, creatures, domestic interiors and vividly imagined Worlds. For those confused about what's going on here or if you just want to listen to the Your Face Theme Tune, there is a page with more details on this blog here. Alternatively click on the 'About This Blog' link to the right. I've got no words to express my excitement about this one. Gosh! I love the internet. I got a message and photo from Lynda Hayes who's voice is permanently ingrained in my mind. 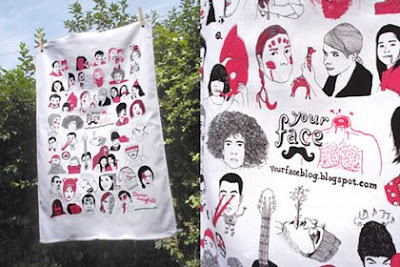 Your Face Tea Towels are now available at Red Door Gallery in Edinburgh. I decided for this portrait I wouldn't add any animals or facial hair as I wanted to capture his true likeness - As you can probably tell, these days he makes his living as some kind of eye magician. 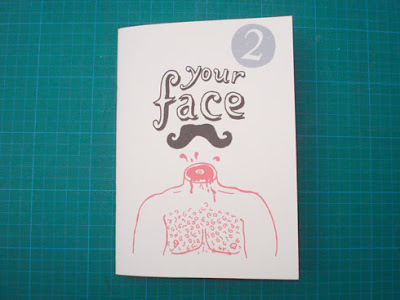 The 2nd printed issue of Your Face will make its debut at Publish & Be Damned (Sunday 3rd August) thanks to Fever Zine who will be stocking it at their stall along with their 4th issue.